Naturally, this is a detail of the bigger map of Nato’s overall strategy with its known aggressive aims and with the main target in this period being Russia. 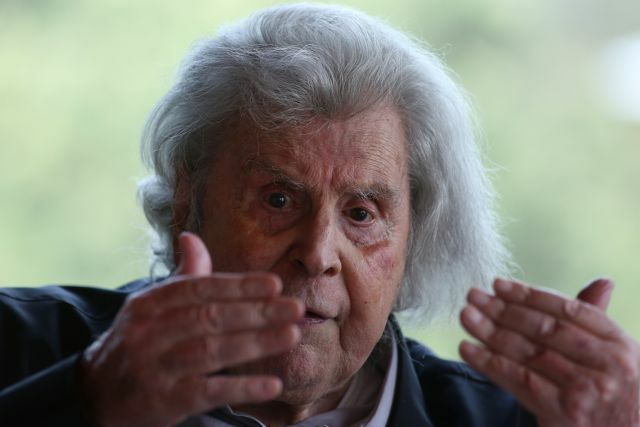 In an opinion piece published today in the daily Ta Nea, famed composer Mikis Theodorakis has again lashed out at the Greece-FYROM Prespa Agreement and lambasted US influence in Greece and the broader region. Theodorakis is also critical of US Ambassador to Athens Geoffrey Pyatt, comparing him to the American ambassador to Greece in the 1950’s, John Peurifoy, who became notorious in Greece for his extensive intervention in post-Civil War domestic politics. The composer claims that the government is transforming Greece into an American base against Russia, with which he says Greece always had brotherly ties. “I have lived through the Peurifoy period which imposed its own law in the shaping of our national life, and which was highlighted by his demand that (left-wing icon Nikos) Beloyannis be executed on a Sunday. Not holding executions on Sunday was a minimum “concession” of the post-Civil War state in the face of Greek citizens’ religious sensitivities. In other words, I am well acquainted with the arrogance of the powerful who in one way or the other impose their will on our unfortunate people. I must admit that the contemporary Peurifoy, Mr. Pyatt, the US Ambassador to our country, has proven to be much higher than his deceased predecessor. He managed to rock a country and divide its people purely in order to admit Skopje into Nato! Naturally, this is a detail of the bigger map of Nato’s overall strategy with its known aggressive aims and with the main target in this period being Russia. Especially due to the peculiarity of Turkish policy, the weight of Nato’s planning has been transferred to our country with the unconditional consent of the Greek government and to the three countries of the so-called Western Balkans – Albania, Kosovo, and Skopje. I admit that I am concerned by the haste with which - along with other means -they chose this ‘awkward’ and provocative manner to force the Greek government to essentially stop tending to the number one problem which is the economy in order to create a great storm around the ‘Skopje issue’ and in order to hide from the people the real reason for this disastrous staging. I am referring to Mr. Pyatt’s order that Skopje be recognised with a name containing the word ‘Macedonia’ so that the long hand of Nato could with a checkmate move on the chessboard of its aggressive preparations transform that country into yet another base to serve its dark designs. Considering all of the above I must confess that I am depressed to see a segment of the descendants of my comrades and fellow-fighters agreeing with the country becoming a base from which to annihilate Russia and the Russian people. They forget that our country always maintained brotherly relations with Russia and that we Greek communists fought hand-in-hand witn the Red Army together shedding our blood to liberate the peoples of Europe from German Hitlerism, which reached the highest step of barbarity with the death camps. Greece’s fascists made the island of Makronisos an enormous camp of this kind, which does not and will not forget who our friends and who our enemies were at various times. We may not have overt enemies today, but we have friends from whom I as a former Makronisos prisoner want to ask forgiveness, because I also believe that the Russian people are a basic pillar of World Peace. Certainly they must know that the current government, which was transformed into a blind organ of Nato, does not represent the Greek people, and that is why it did not hold a referendum. The vast majority of our people want Greece to be a bearer of peace and the brotherhood of nations. The people until now never stood by forces that plot aggressive war and destruction, regardless of any ideology or excuse.